HomeElectricityEnergyEnvironmentRenewable energySolar energyWelfareHow Cement Industry Can Support Environment Using Clean Energy in India? How Cement Industry Can Support Environment Using Clean Energy in India? India is heavily dependent on fossil fuels for its energy needs. Most of the power generation is carried out by coal- and gas-based power plants which contribute heavily to greenhouse gas emission. The Government of India´s immediate goal is to generate two trillion units (kilowatt-hours) of energy by 2019. This means doubling the current generation capacity to provide 24x7 electricity for residential, industrial, commercial and agriculture use. Based on government records as of 30th September 2016, India has a total installed power capacity of 306,358 MW that includes thermal (coal, gas, and diesel), at 213,228 MW; nuclear power at 5,780 MW, hydropower at 43,112 MW, and renewable energy sources account for 44,236 MW. A transition from conventional energy systems to those based on renewable resources is necessary to meet the ever-increasing demand for energy and to address environmental concerns in a sustainable way. India now ranks 2nd, just behind the China, among 40 countries with renewable energy focus, on the back of the strong thrust by the Centre on promoting renewable energy and implementation of projects in a time-bound manner. The government has decided to substantially alter the energy mix that powers India in the future, such that at least 40 per cent of India´s total power capacity will come from renewable sources by 2030. This is as per the country's targets under the Paris climate change agreement. In order to achieve the country´s ambitious renewable energy targets of adding 175 GW of renewable energy, the Government of India is taking a number of steps and initiatives like the 10-year tax exemption for solar energy projects, and is planning to add 100 GW of solar power by the year 2022. The cumulative solar installations in India have crossed the 8.643 gigawatt (GW) mark in October 2016, according to Mercom Capital Group. We will explore how the cement industry can integrate the renewable energy sources, especially solar energy, to reduce GHG emissions and to become cost competitive while meeting the obligations under RPO and PAT mechanisms. The annual energy consumption by cement industry contributes close to 10 per cent of the total energy consumed in entire industrial sector. According to the Cement Manufacturers´ Association, modern cement plants consume 68-93 units to produce a ton of cement while the older ones use up 110-120 units of electrical energy. Climate change and energy security are global challenges and cement industry recognizes the need to contribute its equitable effort as a function of its techno-economic and socio-economic development. The Indian cement industry has realized that strong business growth can be achieved by sustaining manufacturing in an eco-friendly manner. Most of the new cement plants are adopting green processes and green power generation to reduce Green-House-Gas (GHG) emissions. Some of the following renewable energy projects can be introduced in the cement plant to achieve clean and green plant. Power plants based on renewable sources such as wind and solar energy has a great potential to become an integral part of new cement plants. 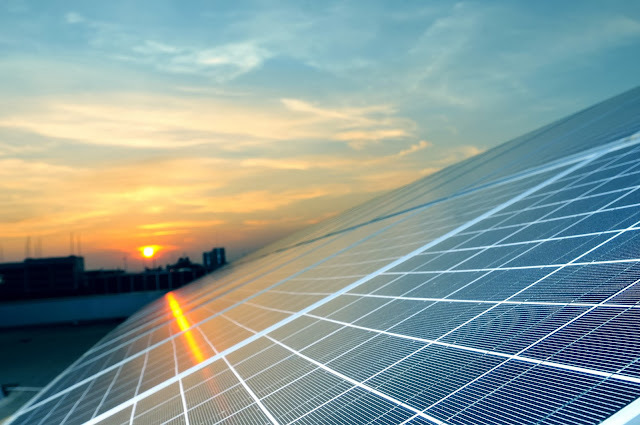 Solar energy has many merits compared to conventional power sources. The solar prices have been falling, and in many parts of India, the cost of solar power is less than the tariff of power for the industrial sector. Since the solar plants have a lifetime of typically 25 years, the energy prices are locked in, unlike in the case of power from utility companies, which is only expected to increase every year. By installing solar power plants and solar water heating systems, cement plants can not only meet the obligations under both RPO and PAT mechanisms, but also reduce greenhouse gas (GHG) emissions. Most cement plants in India are located in dry and hot areas with enormous solar radiation and have huge amounts of unused, un-shaded arid land. This makes cement sector very ideal for deployment of solar power generation plants. Solar energy can be harnessed either by Solar PV or Solar Thermal (CSP-Concentrated Solar Power) Technologies. Based on the available area within a cement plant, we can install the solar power plant considering the solar technology suitable for that geographical terrain. A wind turbine is a system which transforms the kinetic energy available in the wind into mechanical or electrical energy that can be used for any required application. Some of the advantages of wind power plant are-one time installation cost, low operational and maintenance cost, no fuel cost, environment friendly and pollution free, lowest gestation period, limited use of land. Wind farm is located in an area of high wind (usually at a distance to manufacturing facility) with power ´wheeled´ through national transmission grid. It helps cement manufacturers to take advantage of solar as well as wind energy for their cement plants. Two major technologies have been developed to harness solar energy through Photo-voltaic Solar Technology and Solar Thermal Technology. PV solar technology directly converts sunlight into electricity using panels made of semiconductor cells while Solar Thermal Technology captures the sun´s heat that converts to mechanical energy and in turn electricity. Availability of reliable solar radiation data is vital for the success of solar energy installations in different sites of the country (Refer Image -India Solar Resource). The geological locations having annual Direct Normal Irradiance (DNI) of 5.0 kWh/m2/day and above could be more suitable for solar power plant installation in India. According to Ministry of New and Renewable Energy (MNRE), the National Tariff Policy was amended in January 2011 to prescribe solar-specific RPO be increased from a minimum of 0.25 per cent in 2012 to 3 per cent by 2022. Many States have come up with up their own Solar Policy and they have their own Solar RPO targets. The Indian policy for solar power plant greatly favors investors as it gives many benefits over conventional plants & machinery. An accelerated depreciation of nearly 80 per cent as compared to 15 per cent for normal plant and machinery is considered for solar plants that results in huge tax savings for the cement manufacturers. Favorable land laws and other subsidy for solar power generation in cement producing states such as Karnataka, AP, Rajasthan, MP and Telengana. While cement industries in all states can explore solar projects, those in Karnataka, AP and Telengana states, can benefits due to favorable wheeling, banking and CSS charges for open access model. As demand for power increases in India due to industrial and population growth, fulfilling the energy requirement could be a challenge in years to come. However, achieving the energy goals will become much easier with more emphasis from the Indian government and corporate world on renewable energy sources especially on solar power plants. Cement industry in India can play a major role in this area. There are many favorable factors for installing the solar power plant in cement industry such as reduction in installation cost of solar plant, increasing fuel cost, Indirect effect on PAT as the RE power is out of boundary limit, possibility for selling E-Certificate if the reduction target is fulfilled and finally but not the least, solar power will be profitable business in years to come. The government also needs to play a major role, in fast development of this sector by providing necessary policy supports, incentives and judicious tariff plan mechanism. There will be a few initial hurdles that will have to be crossed before the cement sector becomes truly appreciative of the solar technology for power generation. The solar technology providers will have to educate the users regarding the feasibility of their installations. Cement plant owners will have to get over their inhibitions and embrace new technology which will enable them to have sustainable growth while reducing their energy costs and protecting the environment for future generation.